Reverend Captain James Ned Beatty, Sr of Oakwood, GA passed away on November 5, 2018 at the age of 96. A native of Talmo, GA, Mr. Beatty was the son of the late Morgan and Leona Bramlett Beatty and widower of Meta Shine Beatty. He was also preceded in death by three brothers and one sister: Homer, H.T., Hugh and Bonnie. He is a retired Captain, U.S. Marine Corps with 22 years of service; serving in WWII and the Korean War. Captain Beatty retired in June 1961 and began a short career as a Georgia State Patrol Officer. He left this service to accept a higher calling. Mr. Beatty was called by God and selected by the Home Mission Board of The Southern Baptist Convention and North Carolina State Baptist Convention to pioneer and initiate a new mission work of military ministries in North Carolina, Camp LeJeune, Fort Bragg, Cherry Point, Pope Field, Johnson Air Force Base and others. After several years of missionary work, God changed his orders and called Reverend Beatty to become a pastor. 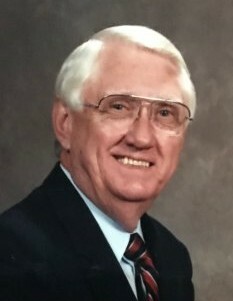 He served several churches as pastor in North Carolina and Georgia. He was a pastor at Chestnut Mountain Baptist Church in the late seventies. After complete retirement, he moved to Oakwood, GA to be near family. He was a member of First Baptist Church of Oakwood. Survivors include: Son, Joel Beatty and wife, Jennifer; Son, James Ned Beatty, Jr. and wife Shelley; Daughter, Jamie Justice-Pittman and husband Jim; Daughter Joni Mooney and husband Paul. One brother, Johnny Beatty and One sister Betty Matsunaga-Fisher and husband Earl. Fourteen Grandchildren and Eighteen great-grandchildren. Memorial Service and celebration will be at 1:00pm on Saturday, November 10, 2018 at First Baptist Church of Oakwood, located at 3780 Old Oakwood Rd, Oakwood, GA 30504; Myles Brown and Randall Reed officiating.